FAA To Passengers: Not Our Job To Regulate Seat Size, Legroom On Planes In a letter responding to a lawsuit brought by the group Flyers Rights, the Federal Aviation Administration said that current seat size is not a safety issue. The FAA declined to regulate seat size and pitch on airlines, saying current dimensions do not present a safety hazard. 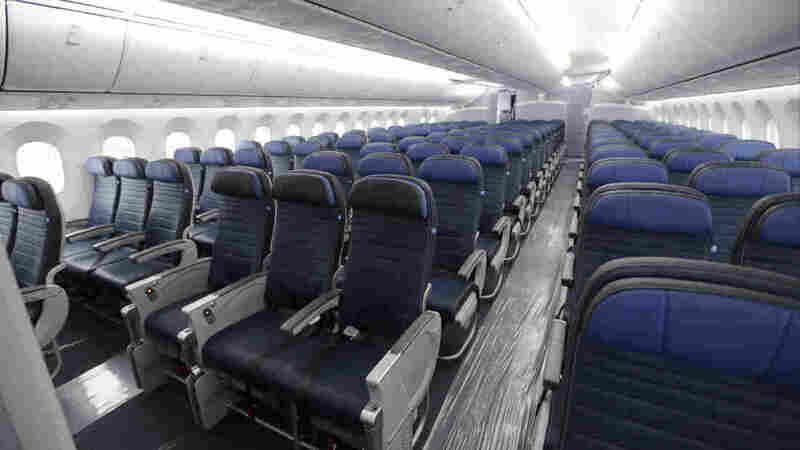 Flyers Rights said that shrinking seats, which it calls sardine seats, present an issue during emergency evacuations, especially as larger passengers could struggle to get out of the seats in a hurry. But the FAA said that current seat size is not a safety issue. "The time it takes passengers to get out of their seats, even if those seats are relatively narrow and close together, is less than the time it takes for the emergency exits to begin functioning and for the line that begins forming in the aisle to clear," Dorenda Baker, executive director of the FAA's Aircraft Certification Service, said in the letter. She added that FAA tests show that seat width and pitch — the distance between seat backs — do not slow down evacuation times; instead, how well passengers pay attention during flight crew instructions largely affects how fast they can get out of their seats. "The FAA has no evidence that a typical passenger, even a larger one, will take more than a couple of seconds to get out of his or her seat," Baker said. Flyers Rights said it's about more than evacuating because tight seating can lead to stiff and sore joints, as well as the risk of life-threatening blood clots from lack of movement. Since 1978, seats have moved 3 inches closer together as airlines jam more passengers on each flight, according to FlyersRights. Average seat width on many major airlines has shrunk by 1 1/2 inches, to around 17 inches, The Washington Post reports. About half of male passengers have shoulders that are wider than the average coach seat, Flyers Rights said in a 2015 petition. And seat pitch has been reduced from 35 inches to 31 inches, with some as low as 28 inches. Last year, an appeals court ordered the FAA to review the issue from a safety perspective and come up with evidence backing up its denial of the petition to regulate seat size. In her opinion, Judge Patricia Millett of the U.S. Court of Appeals for the District of Columbia referenced "The Case of the Incredible Shrinking Airline Seat." "As many have no doubt noticed," Millett wrote in the decision, "aircraft seats and the spacing between them have been getting smaller and smaller, while American passengers have been growing in size." Flyers Rights says it is not done pursuing the issue, noting the FAA has already stepped in to set rules around other aspects of airline seats, including regulating safety belts, headrests and fire retardation. The group's president, Paul Hudson, told NPR that provided there is sufficient public support "and the FAA still refuses to do anything, we may file a court appeal by Aug. 1."